With career streams approaching 100 million worldwide, fans are hungry for music by RCA Records Nashville singer/songwriterRyan Hurd. And Hurd delivers in 2019, with four, full-band performances at some of the country’s most respected music rooms. Hand-picked by Hurd, the clubs set the right feel for Hurd’s trademark powerful lyrics and melodies woven around real-world emotions. Concert dates, which include special guest Ryan Beaver, include the Troubadour in Los Angeles (Jan. 17), the Bowery Ballroom in New York City (Jan. 25), Joe’s on Weed St. in Chicago (Feb. 23), and the Exit/In in Nashville (Feb. 28). Purchase tickets HERE. The praise is earned. The native of Kalamazoo MI is one of Nashville’s most multi-dimensional young songwriters. He has had co-pen credits on some of the format’s biggest hits including “Lonely Tonight” (Blake Shelton), “You Look Good” (Lady Antebellum), and “Sunrise, Sunburn, Sunset” (Luke Bryan). Now with the release of his own music, fans are discovering the fuel that drives Hurd is often love with all its avatars. Inspiration is in close proximity. In March, Hurd released “Diamonds Or Twine” as a present for his then soon-to-be wife Maren Morris after secretly recording the track with his long-time producer Aaron Essuis. Hurd has been on the road with Thomas Rhett, Morris, and Florida Georgia Line. 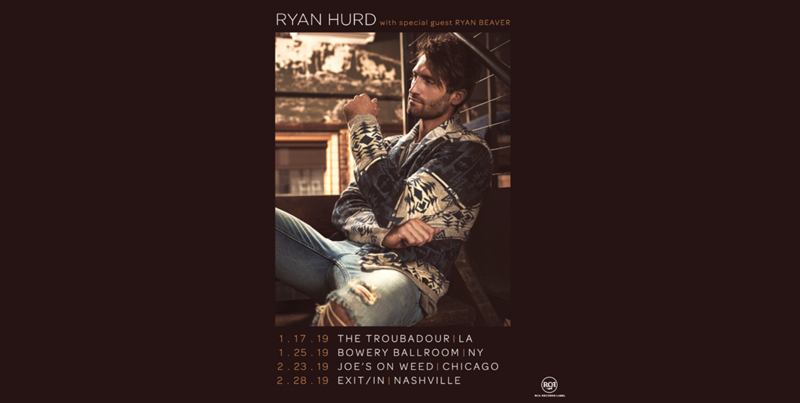 For more on Ryan Hurd and to catch him on tour, visit RyanHurd.com.